As we’ve alluded to before, AmazonSmile is a generous charitable program run by Amazon where 0.5% of your Amazon purchases go to a charitable organization that you choose. Here’s how it works. First, when you start shopping, instead of going to www.amazon.com, go to smile.amazon.com . From that page you can search for the charity you wish to support. Unlike other similar sites that support charities, instead of picking from a list that only includes a subset of them Amazon lets you choose from virtually any organization in the country registered as a 501(c)(3) non-profit organization. Just go to the corner of the page where you see this. I typed in the name of my town and saw 190 charities within a few miles of me. I also entered the name of my church and got a listing of all of the local churches around the United States. Finally, I typed in just about every charity we’ve ever featured on this blog and sure enough, just about all of them were there. 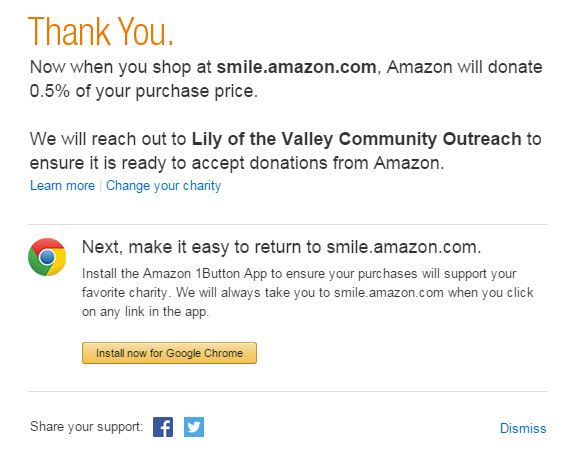 To start shopping, simply click the “Select” button next to the charity you want to support. I chose a community outreach program based in Texas that I know does some great stuff. In addition, throughout your shopping experience you’ll see the Amazon top navigation change to this. 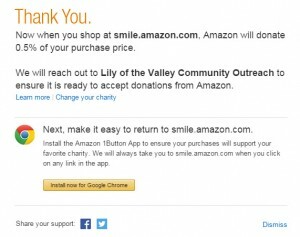 The way it works is that if the organization already receives donations from Amazon your donation will be added to them. If the organization does not already receive domains, Amazon will reach out to them once donations start coming in to set them up. There’s absolutely no cost to you, and in fact other than the change to the logo and the additional line at the top of the page there’s no change at all to your shopping experience at Amazon. It’s pretty smart of them as a company as well–they’d probably be making philanthropic donations anyway for corporate responsibility and taxation purposes so this is a great way to put where the donations go into the hands of their customers. There are a couple Amazon-exclusive products that would be great ways to jump start your Amazon Smile shopping. I’ll talk about a few of them in the next few posts.